Everyone thought I was mad when I announced I was doing a fun run at 7 1/2 months pregnant but it was only 5k and I walk that at least once a week with the dog! I prepared a novelty costume (ofc!) and signed up a couple of gullible folks to tag along and boy did we have a good time! Thousands of women dressed in pink and silly clothes to walk jog or run 5 or 10k, there were pyjamas, lots of tutus and even a bumble bee : D Lots of people had memorials on their backs, my granddad was only 46 when he died of lung cancer and my father-in-law beat stomach cancer back in 2005, 1 in 5 of us will be directly effected by cancer in our lives. 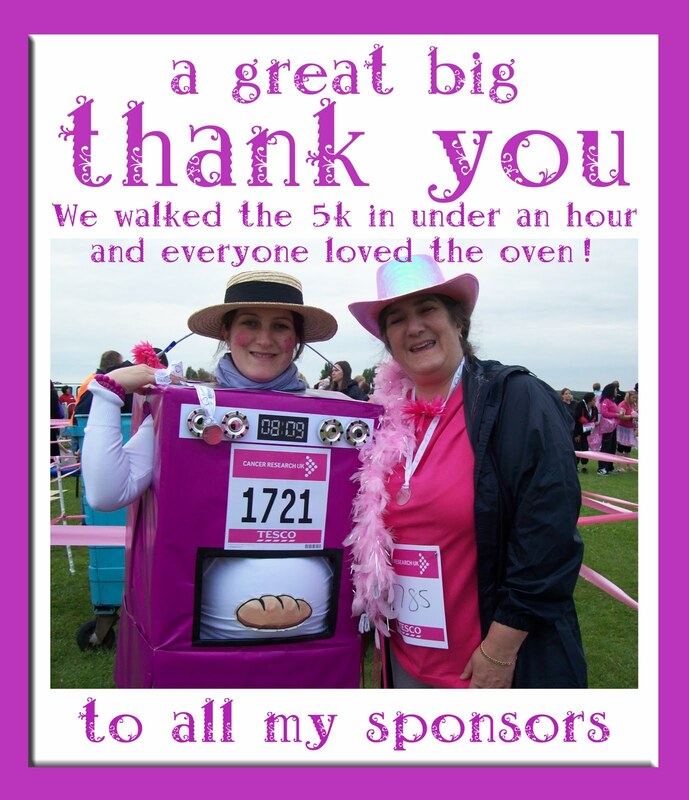 I raised £200 from my sponsors and everyone loved my oven, although some people didn't get it at first, thinking I was a robot or just a pink box lol I'm glad I went, I had such good fun at the Race for life 5k event in North Weald, Epping. 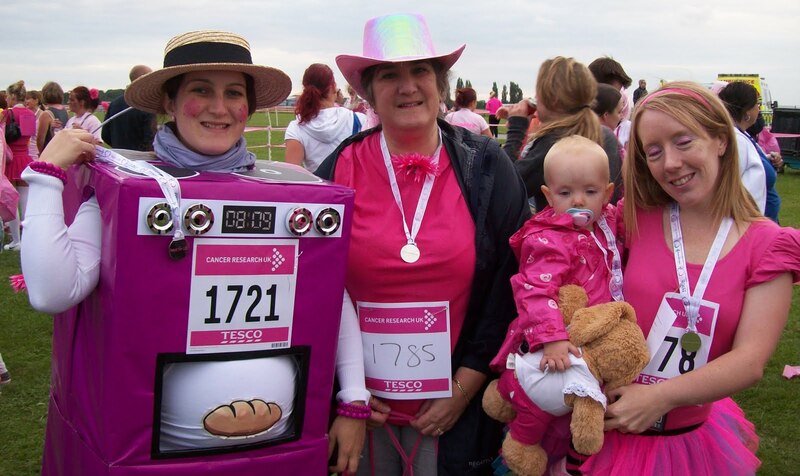 the local newspapers took plenty of photos and Heart Essex were there too, Sue from the breakfast show said my costume was the best one she had seen all year and that is saying something as she has been at over 40 events this summer! When I was at college everyone was on MSN messenger, you logged into a chat function with all your friends (via email) there to chat with, it is safe and easy to use. You can share pictures and links, catch up with news and talk about gigs and parties. Social networking hadn't engulfed the populous, My-space was a new thing and and Facebook wasn't a household name so MSN messenger (often just called MSN) is what those who were "down with the kids" used to communicate online and for many years it reined supreme. Unfortunately few people log into MSN on a regular basis anymore. Plenty of people check their FB and emails every day but enless your looking for sometime to chat with and kill time you don't log into MSN. After years of service it had become superfluous to requirements, this was even more evident when facebook launched its own chat feature. This enables you to see who is browsing online (as I mentioned for most people thats every day) and chat in the background but unfortunately the FB chat feature is a bit of a nightmare. Your window flashes when you receive a message and anything else you may be doing is frozen, which happens too all the FB tabs if you have multiples open. This is supremely annoying if you have people buzzing you often, and don't even think about talking to 2 people at once! But huzzah here is a life saver from MSN, in an attempt to take back some of the online chat glory, the FB chat link feature in Windows Live Messenger Wave 4. You link you email and FB accounts together, enabling you to see all your FB friends who are online in the MSN window, you can then send them messages from MSN that they receive on FB. Enless they also use this feature and then you both chat in MSN like you used to without the hassle and fuss of logging in separately, freezing your tabs or blocking up you FB browsing. Today hundreds and thousands 0f Public Sector Employees including Teachers and Civil servants are striking against recent government action against pensions. Various department pensions have been reduced prompting employees to pay in more and work for longer. Many supporters believe the only benefit of working in the public sector has been the pension scheme and that there is anger that this is now under threat. Some of the disruptions include but are not limited to school closures for a third of schools in England and Wales with more than half the total disrupted. Delays at airports and on trains, and even some coastguards are on strike but The Maritime and Coastguard Agency say all coastguard stations are "operational and appropriately manned". Labour leader Ed Miliband says the strikes are wrong because negotiations are still ongoing. But he says parents and the public have also been let down because the government has acted in a "reckless and provocative manner". Both sides need to "put aside the rhetoric" and "get round the table" to stop this kind of action happening again, he says. Do the public sector employees think they're the only ones who are struggling? I understand the cuts to pensions in public sector jobs are an important part of people’s well being but the fact there haven’t even been any negotiations make it a selfish disruption to everyone else’s lives. The widespread opinion of the private sector is that at least public sector workers get a pension. There are cuts everywhere; in the military pensions are reduced and family services cut, with no chance to strike or defend their future. Entry level soldiers only get £13K starting pay, who spend more than a third of their working life in awful and dangerous conditions away from family fighting for this country. These strikes will only harden public opinion, as it's the average hard working family that's affected.